I have found that ther is a point if you stop digging it fills in and will bury you. 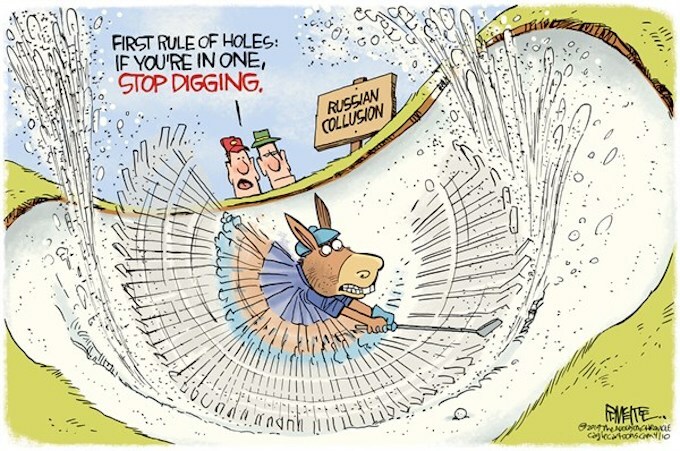 At this point, it is my sincerest hope that the democrats are digging their own grave which they will occupy in 2020. I agree, captjellico. We are at the juncture in history where allowing these conniving VERMIN to get back into power will spell the END of this country as a Free Republic! The Democrat Party has become the subversive enemy within–a nest of traitors and saboteurs that needs to be cast on the ash heap of history where it belongs. It is getting to the point that we need to OUTLAW this nest of traitors called the “Democrat” Party, because it has been TOTALLY co-opted by Globalists and Communists, and there is NOTHING remotely “democratic” about it. Let’s hope that is a LITERAL grave, not just a figurative one. If the analogy was rope, I’d say give them enough to hang themselves. Seeing as it’s sand, give them enough sand to bury themselves. Napoleon once said, Never interrupt the enemy when he’s making a mistake. There are several modern versions of this such as, Never stop the enemy when he’s attacking himself. Foolish Libs, go ahead and keep yapping about Russian Collusion. Many Dems and all independents already bailed on CNN when they realized they’d been lied to for the last 2+ years. Those viewers won’t be returning. When they keep doubling down on stupid, it only proves that it wasn’t an honest mistake. CNN and other Fake news outlets knowingly and intentionally pushed their fake Narrative the whole time, and are continuing to do it. Some starry-eyed Dems are still holding out hope that there would be some small nugget of collusion in the Meuller report. Pop up a batch of fresh popcorn for when the Meuller report is released and their hopes are dashed on the rocks. Don’t bother fixing a drink with the popcorn. We’ll all have plenty of Lib tears to drink for weeks to come. Give these half-wits a fleet of large backhoes and let them totally bury themselves. Don’t give them anything. Let the pay for it, they’re rich enough.